Puck SKLS fans! It’s 2019, and a new year means new things coming for your favorite hockey podcast. As we approach the 1-year anniversary of the founding of “Puck SKLS: Selty, Kok and Lammers on Sundays,” there’s a ton of new content and features to announce. If you’re a fan of the cast, you may be wondering why we’ve taken an extended hiatus from producing new content, our last episode coming more than a month ago now. As the 3 Co-Founders of Puck SKLS, Brandon Seltenrich, Dimitri Kokkinis, and John Lammers are always looking for ways to improve the show, as well as the fan experience. That’s precisely why we’ve taken advantage of our time off from recording to come up with new ways to engage our listeners and make the experience more enjoyable for everyone involved. From here on out, we’re dedicated to giving our listeners something to look forward to every day of the week, delivering our most quality content in a timely fashion. We’ve laid out every facet of our plan for releasing content below to get you excited and ready to resume listening. Enjoy. Appropriately named after the length of a man advantage in hockey, the ‘Puck SKLS Power Play’ is a 2-minute video released across all social media platforms, wherein the three podcast hosts run through the most hot-button hockey topics of the week. Consider this a preview of the week’s episode, giving listeners a glance into some topics of discussion, and a chance to get excited for the incoming episode. We’ve put out polls on social media before, and have noticed a great response from our fans across the board. To try and engage more of you consistently, we’ll be putting out the ‘Weekly Poll’ across all social media platforms asking a question to get your opinions. Each poll and the fan responses will be discussed on the new episode for that week. We understand that we’ve taken our time to record new episodes in the past, and have teased fans in the process, leaving them hanging as to what we’re going to talk about in the new episodes. Put that anticipation to rest, as we’ll be posting the ‘Topic Sheet Tease’ every week before recording, a picture of the biggest topics of discussion for each episode to get more fans excited to listen. In the past year since founding Puck SKLS, we’ve worked hard to create chemistry between the 3 of us and keep episodes rolling smoothly, making sure our fans get the best content we can possibly create. But, we know that sometimes our banter leaves fans wanting for a bit more after the episode is finished. This is why we have decided to curate a series of guest features, starring some people from the hockey world and from the sports world who we know, and are out doing great things in the world. We’ve come up with a list of people we’re really excited about, and we hope you will be too. 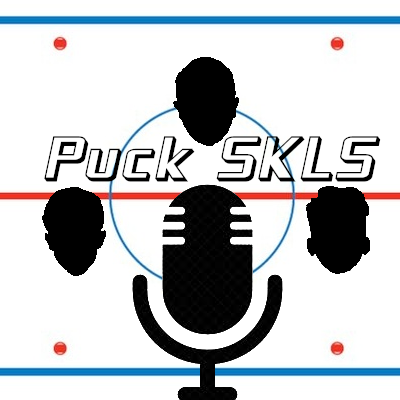 In addition to all these new features, the Puck SKLS crew will be working hard to deliver consistent episodes every week, on a timely basis. Our new release date for episodes will be Fridays. Throughout the week, we’ll be interacting with fans and posting more to social media than we have been, as well. We’re excited, and ready, to put more into this podcast in 2019, and we hope you get more out of it. Until next time, Puck SKLS fans.